With a signaling rate of 480 MBit/s USB 2.0 devices should be able to transmit data with up to 60 MB/s. However today's devices seem to be limited to 30-42 MB/s while reading [Wiki:USB]. That is a 30 percent overhead. USB 2.0 has been a de facto standard for external devices for over 10 years. One of the most important application for the USB interface from early on has been portable storage. Unfortunately USB 2.0 was quickly a speed limiting bottleneck to these bandwidth demanding applications, a today's HDD is for example capable of more than 90 MB/s in sequential read. Considering the long market presence and the constant need for higher bandwidth we should expect that the USB 2.0 eco system has been optimized over the years and reached a read performance that is close to the theoretical limit. What is the theoretical maximum bandwidth in our case? Every protocol has overhead including USB and according to the official USB 2.0 standard it is 53.248 MB/s [2, Table 5-10]. That means theoretically today's USB 2.0 devices could be 25 percent faster. To get anywhere near to the root of this problem the following analysis will demonstrate what is happening on the bus while reading sequential data from a storage device. The protocol is broken down layer by layer and we are especially interested in the question why 53.248 MB/s is maximum theoretical number for bulk upstream devices. Finally we will talk about the limits of the analysis which might give us some hints of additional overhead. Throughout this question only decimal prefixes are used. A USB 2.0 host is capable of handling multiple devices (via hubs) and multiple endpoints per device. Endpoints can operate in different transfer modes. We will limit our analysis to a single devices that is directly attached to the host and that is capable of continuously sending full packets over an upstream bulk endpoint in High-Speed mode. USB high speed communication is synchronized in a fixed frame structure. Each frame is 125 us long and begins with an Start-Of-Frame packet (SOF) and is limited by and End-Of-Frame sequence (EOF). Each packet starts with SYNC and ends with and End-Of-Packet (EOF). Those sequences have been added to the diagrams for clarity. 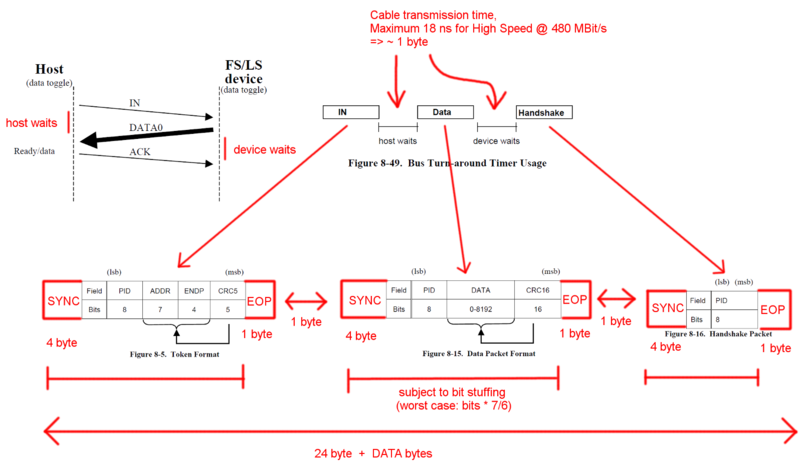 EOP is variable in size and packet data dependent, for SOF it is always 5 bytes. Open image in a new tab to see a larger version. USB is a master driven protocol and each transaction is initiated by the host. The timeslot between SOF and EOF can be used for USB transactions. However the timing for SOF and EOF is very strict and the host initiates only transactions that can be fully completed within the free timeslot. The transaction we are interested in is a successful bulk IN transaction. 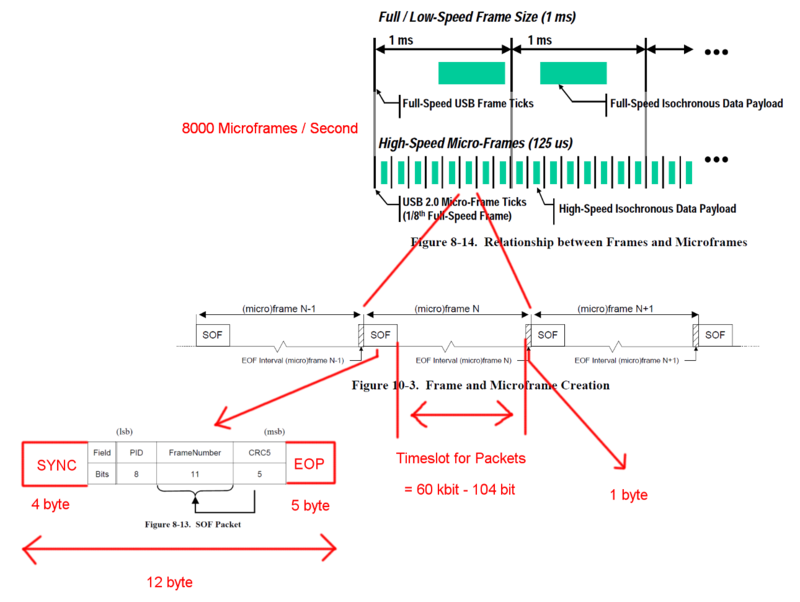 The transaction starts with a tocken packet IN, then the hosts waits for a data packet DATA0/DATA1 and confirms the transmission with a handshake packet ACK. The EOP for all these packets is 1 to 8 bit depending on the packet data, we assumed the worst case here. Between each of these three packets we have to consider waiting times. Those are between the last bit of the IN packet from the host and the first bit of the DATA0 packet of the device and between the last bit of the DATA0 packet and the first bit of the ACK packet. We don't have to consider any further delays as the host can start sending the next IN right after sending a ACK. The cable transmission time is defined to be maximum 18 ns. A bulk transfer can send up to 512 bytes per IN transaction. And the host will try to issue as many transaction as possible in between the frame delimiters. Although bulk transfer has low priority it can take up all of the available time in a slot when there are no other transaction pending. To ensure proper clock recovery the standards defines a method call bit stuffing. When the packet would require a very long sequence of the same output an additional flank is added. That ensures a flank after a maximum of 6 bits. In the worst case this would increase the total packet size by 7/6. The EOP is not subject to bit stuffing. For totally random data we expect that bit stuffing is necessary in one of 2**6 = 64 sequences of 6 consecutive bits. That's an increase of (63 * 6 + 7) / (64 * 6). Multiplying all bytes that are subject to bit stuffing by that numbers gives a total transaction length of (19 + 512) * (63 * 6 + 7) / (64 * 6) + 5 = 537.38 Bytes. Which results in 13.932 packets per Micro-Frame. There is another special case missing from these calculations. The standard defines a maximum device response time of 192 bit times [2, Chapter 7.1.19.2]. This has to be considered when deciding if the last package still fits into the frame in case the device need the full response time. We could account for that by using a window of 7439 bytes. The resulting bandwidth though is identical. Error detection and recovering has not been covered. Maybe error are frequent enough or the error recovering is time consuming enough to have an impact on the average performance. We have assumed instant host and device reaction after packets and transaction. I personally don't see any need of big processing tasks at the end of packets or transactions on either side and therefore I can't think of any reason why the host or device should not be able to respond instantly with sufficiently optimized hardware implementations. Especially in normal operation most of the book keeping and error detection work could be done during transaction and the next packets and transaction could be queued up. Transfers for other endpoints or additional communication has not been considered. Maybe the standard protocol for storage devices requires some continuous side channel communication that consumes valuable slot time. Why are today's implementations not capable of streaming at 53 MB/s? Where is the bottleneck in today's implementations? And a potential follow up: Why has nobody tried to eliminate such a bottleneck? At some point in my life, I used to run the USB business for big semi company. The best result I remember was NEC SATA controller capable of pushing 320Mbps actual data throughput for mass storage, probably current sata drives are capable of this or slightly more. This was using BOT (some mass storage protocol runs on USB). I can give a technical detailed answer but I guess you can deduce yourself. What you need to see is that, this is ecosystem play, any significant improvement would require somebody like Microsoft to change their stack, optimize etc, which is not going to happen. Interoperability is far more important than speed. Because existing stacks carefully cover the mistakes of slew of devices out there because when the USB2 spec come out probably the initial devices didn't really confirm to the spec that well since the spec was buggy, the certification system was buggy etc. etc.. If you build a home brew system using Linux or custom USB host drivers for MS and a fast device controller you can probably get close to the theoretical limits. In terms of streaming, the ISO supposed to be very fast but controllers do not implement that very well, since 95% of the apps use Bulk transfer. As a bonus insight, for example, if you go and build a hub IC today, if you follow the spec to the dot, you will practically sell zero chips. If you know all the bugs in the market and make sure your hub IC can tolerate to them, you can probably get in to the market. I am still amazed today, how well USB is working given number of bad software and chips out there. Each microframe has two thresholds called EOF1 and EOF2. No bus acivity must occur at/after EOF1. Placement of this point is a complicated thing, but the typical position is 560 bit times before the next SOF. A host must schedule its transactions in such a way that any possible response from the channel wouldn't hit this threshold. Which eats about 70 bytes out of your calculated 7487 bytes. You assume "random data". This is completely unfounded, the data can be anything. Therefore the host must schedule transactions for the worst case payload, with maximum bit stuffing overhead, 512*7/6=~ 600 bytes. Plus 24 bytes of transaction overhead, as you rightfully calculated. This gives (7487-70)/624 = 11.88 transactions per micro-frame. Host is required to reserve about 10% of bandwidths for control transactions for any other activity, so we get about 10.7 transactions. Host controller also has certain latency when managing its linked list, so there is additional gap between transactions. The device can be 5 hubs/hops far from the root, and the response delay can be up to 1700 ns, which eats another 106 bytes of each transaction budget. In raw estimate, it makes only 10.16 transactions per uFrame, not counting for the reserved bandwidth. The host can't do adaptive re-scheduling based on actual transaction arrival within the uFrame, it would be prohibitive from software perspective, so the driver uses the most conservative schedule, up to 9 bulk transactions per uFrame, which amounts to 36 Mbytes/second. This is what a very good USB pen drive can deliver. Some crazy artificial benchmarks can go up to 11 transactions per uFrame, which makes it 44 MBps. And this is the absolute maximum for HS USB protocol. As one can see above, there is no botleneck, all raw bit-time space is eaten by protocol overhead. Not the answer you're looking for? Browse other questions tagged usb communication driver protocol bandwidth or ask your own question. Isn't calling USB 3.0 nodes “hubs” inaccurate? USB Mass Storage Device automatic backup system - How many USB Host Controllers are required? Why does usb have start of frame packets?